Dental implants are widely recognized as the best tooth replacement option available. For most people, though, it’s a long process: after a tooth is extracted the socket is allowed to heal and fill in with new bone before implant surgery: that can take anywhere from two to five months. 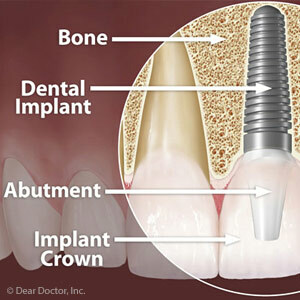 Afterward, there’s usually a two– to three–month period after the implant is placed before the permanent crown (the visible tooth) can be attached. Without adequate bone present the implant’s long-term stability might be compromised. Furthermore, the implant’s durability is dependent upon bone growth around and attaching to its titanium post after surgery in a process known as osseo-integration. These two considerations indeed serve a critical function in the implant’s ultimate success. In recent years, however, a variation to this traditional implant process has emerged that allows for immediate implantation right after extraction. Besides combining extraction and implantation into one surgical procedure, immediate implants minimize the disruption to a person’s appearance (especially with visibly prominent front teeth) when combined with a provisional crown. Immediate implants joined together that replace a full arch of teeth can receive biting forces and succeed. Individual implants that replace single teeth, however, won’t work in all situations and must be undertaken with care to ensure long-term success. Because there may be less available bone, the implant must fit snugly within the socket to maintain as secure a hold as possible. The surgeon must also take care not to damage too much of the gum and bone tissue when extracting the tooth, which could affect both the integrity of the implant and its appearance in the gum line. Temporary crowns may be attached during the implant surgery, but they’re installed for appearance’ sake only. For individual crowns, they must be designed not to make contact with the teeth on the opposing jaw to avoid generating biting forces that will cause the implant to fail and stop the bone-healing process that occurs with osseo–integration. If you’re considering dental implants, it’s important to discuss with us which type of procedure, traditional or immediate, would be best for you, and only after a comprehensive examination of your mouth and jaw structure. Regardless of the approach, our goal is to provide you with a smile-transforming restoration that will last for many years to come. Download your new patient form and fill it out in the comfort of your own home.